If your kids are struggling with recognizing which shoes go on the correct feet, here is a quick and easy way to help! 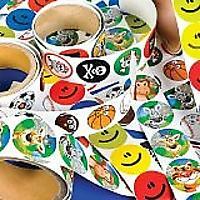 Have your child pick out their favorite sticker. Cut the sticker in half. Place each side in the corresponding shoe. When your child goes to put his or her shoes on, all he or she has to do is make the sticker match! With this easy trick, kids can learn independence, confidence and how to tell their left from their right. They will be putting their own shoes on and running out the door in no time! 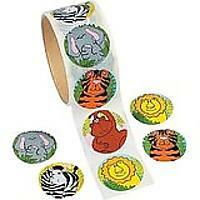 This sticker roll contains 100 zoo animal stickers. Kids will go wild over these jungle animals! These stickers are a great way to decorate goody bags or to reward a hard working student - or help your child learn his right shoe from his left! I adore this tip! I will be using it for Bryson AND Charlotte! Kid's Feet Stink? Try This Easy Parenting Hack to Foil Foot Odor! How to Teach Your Child the Power of Making the Right Choices!